WHILE THE JEW-OWNED PRESS revs up its War Cry preceding NATO’s meeting in Wales, there’s little enthusiasm for Jewish war-mongering in Europe’s heartland. Recent calls by Jewmerica and its NATO military arm to deploy a long-planned missile defense system on Russia’s western border is meeting resistance by most of Europe, especially Germany. Germany argues that since America (and Jewmerica’s NATO) has “spent years” insisting that a Missile Defense Shield was not directed at Russia but against Iran, it would harm NATO’s credibility to suddenly justify the Shield as aimed at Russia. Be that as it may, Jewmerica and its global NATO arm have gotten away with SO MANY LIES that one more lie will not deter their pernicious intentions to spark World War 3 against Russia. And with Jewry’s shill Chuck Hagel urging NATO members to “pitch in” for Jewmerica’s War Cry against Russia, only four of the 28 members spent the 2 percent of their GDP on defense last year that they had agreed to spend. Yes, France did suspend its delivery of the first Mistral carrier to Russia due to “circumstances for delivery” as “not right” at this time. And to “keep the Germans down” remains the aim of Jewmerica. 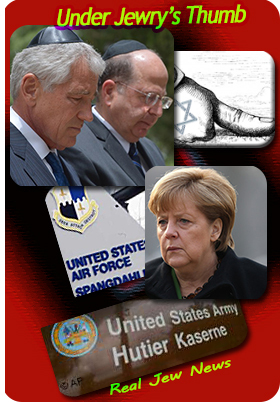 THERE ARE currently 21 US military bases in Jewish-occupied Germany. Jewmerica’s position is that World War II never legally ended, no peace treaty was ever signed, Germany has no Constitution, and that Germany is STILL occupied territory. Given its “occupied” status, Germany remains hostage to the tyranny of world Jewry. 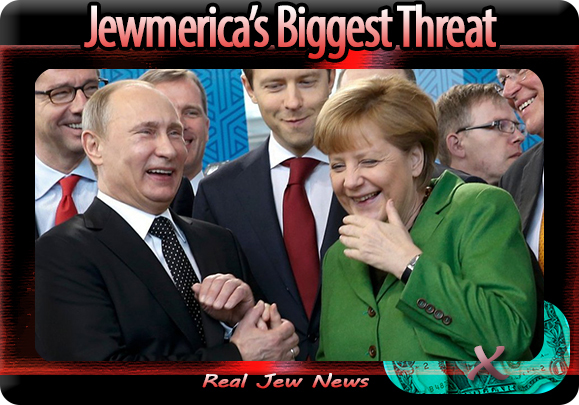 The key that unlocks Jewmerica’s agenda to foist a war with Russia on Germany and the rest of Europe is its fear of Putin’s New Silk Road joining Germany and China through Russia. This portends the end of the Jew-enabled dollar as the world’s reserve currency. With Germany trading in the Yuan and the Ruble it’s bye-bye Jewmerica with its rule of the dollar soon to be dethroned. NATO is ‘good Jewish business’ but the store is about to have a clearance sale. Jewmerica wants WAR and continual HOSTILITY with CHRISTIAN Russia. BUT, Germany (albeit posturing as ‘tough guy’) wants nothing to do with it. For while NATO is GOOD for Jewish business, it’s war cry is BAD for German business. We simply need to be patient. A ‘different world order’ is in the making with a New Silk Road that unites Europe with China THROUGH Russia. This portends the END of the Jew-enabled dollar as the world’s reserve currency, the ONLY thing that keeps Jewmerica as the world’s tyrant. With Europe trading in rubles and yuans it’s bye-bye to Jewmerica’s world rule. WITHOUT YOUR financial help I will not be able to continue. Street Evangelism Schedule…Streets Across America! Boston - September 24-28 DONE DEAL! Love those punch lines, Bro! There is no Warsaw Pact. There is no Soviet threat. Nor is there any threat from the new Russia other than the one deliberately provoked by Nudelstein and Co. Instead of being a defensive organization NATO has become an offensive organization and a threat to world peace. Therefore dismantle NATO. Its the only way to get these warmongering Jewish NEOCONS out of our hair and return the world to normality! Damn Jews would rather have a nuclear conflict than lose power and fiat money wealth. One day Merkel looks like she is getting along well with Putin and the next day she is behaving like a “Jew-ruled” idiot. It’s hard to understand exactly what is going on. Alarm clocks are going off everywhere, thank you Brother Nathanael! It’s not so hard to figure out. This is part of the game called confusion or “flux”. Russia is rattling sabers, just because everyone else is. Israel is saber rattling because it’s method of carrying out the Protocols of the Learned Elders of Zion. Nato is saber rattling because it has become the police of the NWO. America is saber shaking because it is playing all sides against the Peace. France and England are laying low to see who emerges as the strong side to be on. ISIS is saber shaking and swinging because they are being paid by CIA and Mossad to do so. Syria is on hold because the CIA money has dried up. German, French, British, Dutch special forces have joined the Ukraine Freedom Fighter movement against the US-EU-NATO supported regime of Kiev Fascists. The fall of Kiev should take place before the Christmas Holidays, thus exposing the United States for its dastardly role as fascist puppet master and in war crimes.. The imported mercenaries are being captured, along with NATO high ranking officers. The crippling upcoming blow will be the failure to bring the ample harvest to market, as starvation becomes widespread. If Germany can throw off the yoke of its occupation, there is hope that America can do the same. What is going on is that Merkel is nothing but a crass politician, bought and paid for with Jewish threats and a few shekels. Germany needs a statesman. Gerhard Schroeder is a far sight better, but Germany needs even better to break the chains. Russian investigators seize assets of Jewish billionaire. As NATO is on one line with nazis following the same agenda and led by the same institutions, there are also new (old) hauptmannen such as Chuck Hagel as Hermann Göring, and Donkey Rasmussen as Heinrich Himmler, besides many other opportunists you see only when dirt lay open in the field. But, as history proves: they were all big losers. And so this will also be a failure, just like barking dogs, now you see (and hear) them then not any more. And the Chinese are building up their defenses wich they when powerful enough will use to attack the hated Western world. What if the ordinary person bought some Russian Rubles and Chinese Yuan? I mean a sizeable amount of people in the West doing that. I wonder if the Jew owned banks would take notice along with their bought off politicians and rethink their ways? Russian Credit Card would be nice. Yuan only at your favourite Chinese Restaurant! I just want all of this to be OVER. Women are now wasting their time raising families, only to have their children wasted in wars. Mostly Men are out raising Hell without a care, and for no real reason. God bless you and thank you for a terrific article, and the montages are great. Hagel looks like a yarmulke-wearing whipped dog. The vain peacock Anders Fogh Rasmussen looks like he has a new lease on life with Yats as his new best friend, now that NATO thinks it has some kind of “function” again because of the civil war in Ukraine and the threat of Big, Evil, Vlad the Bad. Yes, the wardrums are still beating on both sides of the Atlantic to push for further NATO involvement, military upgrades and rearmament. I think that Kiev is going mad as well. 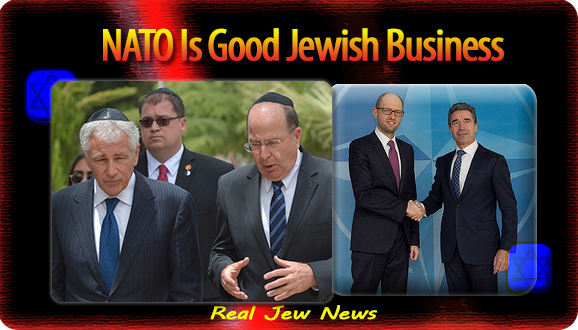 NATO is ‘good Jewish business’ as is all war since the Rothschilds began playing all sides of any European war. In the meantime, Russia is not particularly distraught, handling each problem as it arrives. The Foreign Ministry is constantly stressing the need for international pressure for a cease-fire for Ukraine. The RF government has now impounded an office building belong to the arch-Punisher, Igor Kolomoisky, Israeli-Ukrainian-Cypriot citizen and Junta-appointed governor of Dnepropetrovsk who also had a criminal arrest warrant issued against him back in July as well. Russia’s Investigative Committee has declared it has imposed arrest on the office building belonging to one of the companies owned by Ukrainian big business tycoon, Dnepropetrovsk Region’s Governor Ihor Kolomoyskyi. “On the basis of court resolutions the building in question was searched and some documents of importance to the criminal investigation found and confiscated. Moscow has not failed to notice the statements by Ukraine’s Defence Minister, Valery Geletei, who said that “the operation to liberate eastern Ukraine from terrorists is over” and announced the start of a “Great Patriotic War,” arguing that “tens of thousands” will fall in this conflict. The sanity of Ukraine’s Defence Minister, who posted this on his Facebook page, is something to be gauged by specialists in areas other than the military affairs. The only noteworthy message in this text is the appointment of the Chief of General Staff, Viktor Muzhenko, as the “architect of glorious victories” by Ukraine’s armed forces in southeast Ukraine. Mr Geletei’s call to prepare for another “tens of thousands” of victims in what he calls the “Great Patriotic War,” which will be in substance a new punitive operation in his own country, is utterly shocking. In so doing, he draws the Ukrainian people deeper into the continuing bloody civil conflict. The European history has hardly ever witnessed such a perfidious pretext for staying in office at whatever cost. One can hardly believe that such utterances come from a defence minister of a civilised country. Otherwise, it is simply incomprehensible how tens of thousands of Ukrainian families could have entrusted to this bureaucrat the lives of their children, brothers and husbands, who have been drafted into the Ukrainian army to take part in the fratricidal war in their own country. God bless and keep up the excellent work! My contribution is on the way. Good stuff Brother Nathanael! I love the pictures you come up with. Yes and let us not forget who turned the USA into the worlds tyrant - Rothschild and his Israel with their fiat currency and Zionism! With help thanks to Arthur Balfour. America was a small empire but only grew into the worlds biggest tyrant when in the early 1900’s Woodrow Wilson caved to the bank cartel by signing the federal reserve act. If we also consider that US Congress are loyal to their AIPAC lobby and fiat currency campaign contributions we see that it is actually Israel who is the worlds biggest tyrant using the USA as a proxy. Insane! Insane how one of the greatest most powerful nations in all of history was usurped so easily in less than 100 years. Keep up the great work Brother Nathanael and RJN staff, it is MUCH appreciated. You say it so truly, Brother! I’m afraid this will sound almost too terrible to print, but the Jews of Jewmerica must be chastized for their grand stupidity. They HAVE made themselves, and their relentless media, NGO and military operations, into the bedbugs of Christianity, of civilization. These bedbugs, like Soros and Porochenko, and Nuland, are as inhumaine as they are unrealistic. NATO must be good business for the oligarchs — for the handful of Jews who create them. This bedbug called NATO is dangerous one. Even if it sheds its mantle (the divine rights of Jewish oligarchics), and pretends to cloak itself in a new mantle (imaginary Jewish empathy for the grassroots), NATO will still be the spear point for a global Uni-Polar concept. Putin is absolutely correct in his desire to expose the dangers of a UniPolar world, run by Jewish oligarchs and their NGOs. As a roving military power, with no “homeland” of its own, with no actual political legitimacy to back it up, NATO becomes a highly profitable smokescreen Jewish owned black-ops cutouts. Retired (blackmailed) politicians and military brass are given pensions with travel by protected motorcade. Notwithstanding the horros of the indirect reference to Zyklon-B, the oligarchs, the NGOs, and black ops militaries, have all been behaving like persistant bad bedbugs. How does Christianity, or civilization, get rid of these bedbugs so that children can sleep safe at night? So that they can wake up in the morning and hope for a future where they are not lied to by “their own” governments? Not only because of the courage of Brother Nathanael and his staff for listing the names of dangerous Zionist crazies, but also because of the readers who chime in with links to other valuable information. I literally laughed out loud at the article posted by Ft. Nolan explaining how Putin is ignoring Obama’s phone calls and emails. CitizenFitz, thank you for posting that scgnews article, I had no idea ISIS was just al qciada rebranded. Likewise, thank you to Steve2, and KathJuliane for posting info on Igor Kolomoisky’s assets being confiscated by Russian investigators. This is how we defeat the enemy, through information sharing and unity. I don’t know how so many comments are actually hopeful at this time when the Zionazis have almost achieved Armageddan. Down here in Australia our media are so overwhelmingly cowed by the Israel Lobby that the disgraceful mass murder in Gaza has blamed the Palestinians themselves as per IDF spin, while the video execution of some “whitemen” is represented as far more heinous! God help us in our ignorance. Our Prime Minister and our whole government are yapping dogs of marginal intelligence who do what they are told by Washington and the Sayanim. As a result of our relative importance on the world stage you probably won’t notice when he declares war on Russia and the Muslims for a dish of dog biscuits. The chief of our ‘intelligence’ service is one David Irvine! Now, some of my best friends are Jews but this going too far. The way things are going down here it may soon be illegal to think. Keep up the great work Bro. I have sent you what I can afford. I urge fellow readers to do the same and spread the word. Whenever you communicate include the Bro’s links so that others can make their own minds up based on some reality. Thank you for your encouraging words. I appreciate it! That being the case I strive to maintain EXCELLENCE, ACCURACY and INTEGRITY in my journalism reflected in my Articles and Videos. I am DETERMINED to CONTINUE so long as readers and viewers are willing to help me financially. Tomorrow, September 5, is my Birthday. I will be 64 years old…but I feel like I’m 20! I plan on a long, SUCCESSFUL ministry. There is MUCH to do and to ACCOMPLISH. At this turn in my life on my Birthday, I am CONFIDENT that some KNOCK OUT PUNCHES are in store for wicked JEWRY and we soon see God’s wrath fall upon them. I eagerly AWAIT that day. Will Jews repent? I doubt it. Please HELP ME to CONTINUE with “great words” Too! As always, you’ve done it again; came up with another outstanding article about Organized Jewry’s shenanigans. I love it. I’m also glad you received my online contribution; and that it’s helping you produce your videos and travels for your street Evangelism. Oh yes, Paul Craig Roberts has used the term “presstitutes” again in his latest article on Press.tv. Time for another rebuke from you to him. You’re absolutely right. With the dissolution of the Warsaw Pact in November of 1989, NATO has, at the same time, lost is relevance for its continued existence. The USSR was already in decay; and, a year or two later, it was gone. NATO has since evolved from a purely defensive entity to an offensive one, due to its hijacking by Organized Jewry. The US (now the USSA) was already hijacked over a century ago with the establishment of the privately owned foreign (Rothschilds of London) Central Bank, aka Federal Reserve. This is certainly not the NATO of the Cold War era; NATO is now a threat to world peace; since, it’s now World Jewry’s attack force against the rest of humanity. Happy birthday, Brother Nathanael! Your wit and message has held its ground for 64 years. If it’s God’s will, you’ll make it to 95. It’ll take awhile for Jewry to fall down on its face. God’s judgment will take place hard and suddenly. Brother Nathanael, you’ll live to see the rise of Russia as the new superpower while our dollar is reduced to sawdust. But only 130? However many years you’re given, we won’t see your like again! Happy Birthday to Brother Nathanael! This website mentions Jews as the culprits connected to crime and other unpleasant things they do. Nodisinfo is another website that does it! This article (although doesn’t mention the word ‘Zionist’ or ‘Jewish’ and that website never does) tells a story about what happened to a US congressman who opposed the Zionist owned and controlled fraudulent US tax system known as the IRS. I knew that Brother Nathanael would be on the spot with it. Excellent article. Night-night ISIS. You had a good run. Lots of snackbars and highlights. They were not nice people, but neither is anyone else. Especially in that region. It’s a Jew-world though, and they weren’t invited. Brother Nathanael God bless you. You truly are a light upon the nations. Happy Birthday! 64 years young! God grant you many, many more years — at least to 130! Don’t forget that the Jews have plenty of usefull idiots helping them out along the way. Especially in the Media and the State Dept. There are no shortage of people willing to sell their souls out to the devil. All I’ve got to say is, I hope that Western Europe will get along with Putin because he is not afraid of nuclear warfare. Even the terrorists are afraid of Putin. Your work here will live far beyond your physical body. Have you ever thought of writing a book? A website is great but if you get a book in circulation it could stay in people’s hands for who knows how long. Speaking of books, I found another priceless bit of information last night, a interview with a woman named Susan Lindauer. Susan Lindauer was a former US CIA asset in the years leading up to the 9-11 attack, in which she was a mediator (back channel) for Iraq and the CIA. Here is a link to an interview she did with a man named Kevin Barrett. I know some people don’t like Alex Jones but this link has a bunch of information and the transcript. If people want to search, there are plenty of links that come up in google. I see from reading other’s posts that it is +BN’s birthday today. 64 and going strong! What a man. To our RJN regular audience and others starting to pop into this website: cherish this man and extend financial support for his work, if you can. This kind of individual who consistently exemplifies courage, thorough understanding, integrity, and conviction does not come along very often — roughly once in a generation. This man’s work is special, and someday (who knows when) a lot more people are going to begin to understand it. Someone just wrote to me asking why I keep on making Donation Appeals and why I have expenses. Here’s what I answered him. I live a very austere monastic lifestyle. I don’t even have a car! But I do have to eat (one vegan meal per day) and I do have to pay rent. BOTTOM LINE: WITHOUT Reader’s and Viewer’s financial help I am not able to continue. I am dependent on donations! On a deeper level however, the assumption underlying the current NRA approach is that governments historically have been the biggest threat to Jews. With the single exception of Nazi Germany, while some elites have had ambiguous relations with their Jewish populations (which on occasion led to expulsions) the overwhelming trend throughout Jewish history has been that Jews have been willing agents and partners of the ruling elite. Whether as Medieval tax farmers, early modern ‘Court Jew’ financiers, or the intellectual shock-troops of Bolshevism, Jews have only very rarely found themselves threatened by government or monarch. Nowhere is this made more evident than in the simple fact that in Orthodox Judaism the prayer Hanotayn Teshu-ah is not said for the nation or the people of the country in which the Jews have settled, but rather for the monarch or government. Listen closely: If Putin and Russia fall to the Jews, it’s all over in America for you and for me. Everything is in place for the final end of our once great nation. Our Constitution, as has been said, is today treated like a piece of toilet paper. The ethnic cleansing and genocide of patriotic Americans may soon begin in earnest. If Putin falls, the whole world will stumble progressively toward captivity. That is why the Jews despise Putin; he alone is holding them back. It is why we must pray that Russia succeeds and that Putin overcomes this horrendous spirit of Satan that threatens us all. Jews are heartless fiends who have no concept of God, or universal morals. They know only about materialistic worth, and will run over their grandmas to extract the most wealth they can. They are servile entities who impose their insolent judgment on powers of control: the economy, academia, politics and spare nobody. The Tribe is indeed a form of an international apparatus with arms operating by Paris by day and London by night, and America in the morning. I think it is do or die for planet Earth, including Whites and conservatives, to either uprise or become a mulatto cattle race in an Orwellian nightmare. This is a chilling thought, just writing it. It is really sad when someone like myself, a hard working youth in college as to face this Weimar Republic X 100 degeneracy on a 24/7/365 basis. They will pay for robbing my childhood and ruining my country by brainwashing our women, and making a mockery of the Constitution. They will surely pay for their crimes. We have all head about the US government funding ISIS, however only so much proof has surfaced…until now!! Rather surprisingly I came across a business website named ISIS whose acronym stands for Integrated Systems Improvement Services Inc.
At first glance I thought this was just another ‘run of mill’ company that had nothing to do with ado. But upon further investigation and research my initial thought was dead wrong! Now to clarify, I’m not claiming this company is linked to ISIS, however I am asking the question, and quite frankly I would think that if the US government wanted to keep this business “incognito” they would not name the terrorist group ISIS. However maybe their idea is to put it in plain sight so people deny it all together, which we all know is another strategy often used by the global elite. Either way, you really must check out this video and then you decide…. “ISIS is headquartered outside Fort Huachuca in Sierra Vista, Arizona. Our Washington D.C. office is located in the Ronald Reagan Building. We are dedicated to supporting our national defense and security departments, as well as government contractors and private business, with mission-critical services performed by highly skilled experts in their fields. May you be blessed for many years to come. And may JESUS bless you in your quest to expose the Zionist murderers and their evil agenda. First of all, Integrated Systems Improvement Services, Inc. (ISIS) is a private company which may or may not contract with the US government. As a private contractor, that does not make them a government agency nor would the government name them. There would have to be more than acronyms in common to prove some kind of real link between this business and the jihadist organization. Secondly, acronym finder lists 77 entries for ISIS listed by categories Information and Technology, Military and Government, Science and Medicine, Organizations and Schools, Business and Finance, including Islamic State of Iraq and Syria. It is sometimes called ISIL — Islamic State of Iraq and Levant — and now just IS (Islamic State). The Arabic name for the group is Al-Dawla al-Islamiya fi al-Iraq wa al-Sham, whose acronym DAIISH isn’t used in English-language reporting. Many western officials – including Foreign Affairs Minister John Baird, U.S. President Barack Obama, Secretary of State John Kerry and the United Nations – use ISIL. News outlets including CNN, the New York Times and BBC have been using ISIS, although BBC is calling the jihadist group the Islamic State of Iraq and the Levant but shortening it to ISIS. This can mean the Levant, Syria or even Damascus but in the context of the global jihad it refers to the Levant,” BBC explained in a post profiling the organization, which formed in 2006 and went on to become one of the principal groups fighting government forces (and rival rebel groups) in Syria’s civil war. “The Washington Post has been referring to the organization as ISIS, shorthand for the Islamic State of Iraq and Syria. This is how most news organizations that operate in English began identifying the outfit when it emerged as a dangerous fighting force two years ago, launching terror strikes and carving out territory amid the Syrian civil war,” Washington Post foreign affairs writer Ishaan Tharoor wrote. Global News, for its part, is using ISIS moving forward. “The group’s most influential presence is in Syria and Iraq,” said Ron Waksman, the Senior Director of Online, Current Affairs and Editorial Standards and Practices at Global News. The Associated Press, meanwhile, believes ISIL is the most accurate translation of the group’s name and “reflects its aspirations to rule over a broad swath of the Middle East,” AP vice president and senior managing editor or international news John Daniszewski wrote. “Saying just ‘Iraq and Syria’ suggest incorrectly that the group’s aspiration are limited to these two present day countries,” AP standards editor Tom Kent argued. Then again, given the Levant’s colonial origins, that likely isn’t a term the group would choose, either, the New York Times notes. Quartz, a digital news outlet that has chosen to use ISIL, notes the same debate is happening in Spanish, German and Russian media. Still confused? It’s ok: So is everyone else. While NATO leaders in Newport Wales debate the Atlantic Alliance’s role “in containing a mounting militant threat in the Middle East”, it is worth recalling that in 2011 at the outset of the war in Syria, NATO became actively involved in the recruitment of Islamic fighters. “Also discussed in Brussels and Ankara, our sources report, is a campaign to enlist thousands of Muslim volunteers in Middle East countries and the Muslim world to fight alongside the Syrian rebels. “The Turkish army would house these volunteers, train them and secure their passage into Syria. (Debkafile, August 31, 2011 emphasis added). “NATO and a number of European governments, most significantly the UK, have started airlifting heavy weapons to the Syrian rebels poised in Aleppo to fend off a major Syrian army offensive, according to debkafile’s exclusive military sources. But these “Barbaric Killers” were created by the Western military alliance. They are serving the strategic interests of the U.S., Britain, not to mention Israel. “They are Our Terrorists“. Without the terrorists, the “Global War on Terrorism” would fall flat. The Obama-Cameron narrative borders on ridicule. It is not only absurd, it is criminal. What they are proposing is an all encompassing NATO mandate to “Go after Terrorist Entities” which they themselves created as part of an insidious intelligence operation to destabilize and destroy both Syria and Iraq. British and French Special Forces have been actively training Syria opposition rebels from a base in Turkey. Israel has provided a safe haven to Al Qaeda affiliated rebels including ISIS and Al Nusrah rebels in the occupied Golan Heights. Netanyahu has met up with jihadist leaders in the Golan Heights. The IDF top brass acknowledges that there are “global jihad elements inside Syria” supported by Israel. Image left (on site): Israeli Prime Minister Netanyahu Shakes Hand with a wounded Al Qaeda Terrorist in occupied Golan. Lest we forget, Al Qaeda was at the outset a creation of the CIA. Who is behind the ISIS terrorists? The mainstream media is mum on the subject, despite mountains of evidence that they are creations of the Western military alliance. I wish you much health, strength and heavenly protection. Keep up the fight for the truth and for our Lord Jesus Christ! Dilma Rousseff was the Ultimate Target of the CIA’s Assassination of Eduardo Campos. The suspicious death of Campos in Brazil appears to be a carbon copy of the CIA’s quick dispatch of Sá Carneiro, with Rousseff the ultimate target of the action and Silva and her globalist backers as the beneficiaries. Campos was replaced on the ticket by Silva, who is a darling of the Soros-financed and directed globalization and «civil society» movement. Silva, who is a pro-Israeli adherent of the Assemblies of God Pentecostal church, is much more pro-business and pro-American than Rousseff of the left-leaning Brazilian Workers’ Party. Latin America, in particular, has been plagued by plane crashes that have killed two leaders who were determined to pull away from American political influence, President Jaime Roldos Aguilera of Ecuador and President Omar Torrijos of Panama. Both leaders died in 1981, with Roldos dying just a few months before Torrijos. John Perkins, the author of Confessions of an Economic Hitman and a former member of the U.S. intelligence community, fingered the United States in both plane crash assassinations. Another outstanding article by Brother. NATO was formed after Rothchild Stooge EX PM Churchill, ‘destroyer of worlds’, was sobered up, and pushed out again to declare the Cold War in his famous ‘Iron Curtain Speech’ Kosher Conservatives drool over. All, after he and FDR gave Stalin all he wanted to crush Nationalist Germany and their Allies. So NATO was secretly known to be formed for: “Keeping the US in, Germany down, and Russia out.” It is was/is a front for the International Jew Banks. (See THE END OF SOVEREIGN AMERICA- REAL JEW NEWS.COM-master piece of Brothers) and nothing else. Gorbuchev was assured that if the ‘Wall’ came down, NATO would not be pushed into Eastern Europe or the old Soviet Republics. THE JEWS LIED…. The Jews, who operate by formula, are using NATO against Putin’s Russia as they did the Treaty Of Versaille against Germany. Goading Russia with Ukraine as they did Germany with Poland. See : HITLERS WAR: What Historians fail To Mention YT. HITLER’S MESSAGE TO THE NWO- YT. Ben FREEDMAN: A JEWISH DEFECTOR SPEAKS OUT- YT. Do not forget sending some cash to Brother! Jews give billions to rule us, and we can give a little for liberation! Amid NATO’s failures in Ukraine, America’s terrorist mercenaries threaten war with Russia. As the crisis in Ukraine continues to fare poorly for Kiev and its NATO-backers, an “unlikely” ally has emerged – ISIS. Threatening to “liberate” Chechnya and the Caucasus, ISIS would essentially be handing over regions of Russia to its Western and Persian Gulf sponsors. While one would imagine the West would attempt to at least appear to stand in solidarity with Russia in the face of this recent threat, it has instead used the threat to stir fear among Russians, and as leverage against Moscow. In it contains astounding admissions – that NATO’s agenda is expanding itself all along Russia’s borders, that “the EU is now in direct competition with Russia over the future of the lands straddling the EU and Russia,” and that its plans in Ukraine are in utter disarray. This Jew-peddo is today a leading politico in EU. Brother Nathanael, you know what I have to say to those who criticize you for ASKING for donations? Would they rather you forcefully STOLE their money from them like the IRS does? Ha! Funny how those people don’t protest that type of thievery but will scoff at one for asking for a donation. Funny isn’t it how so many of those campus commie leaders back in the 60’s were Jews…. Does pointing that out make you an anti-Semite? How I know for 100%, absolute certain, Brother Nate isn’t a sayanim: he’d have bounced me long ago if he was. I see Jews as the apex predators of the human world. But unlike carnivorous dinosaurs, wolves and big cats, they have the ability to pacify their victims so that they want to be eaten. Such is the fate of the American gentiles who really are like the sheep of the Bible. It’s so easy to prey on them. And I suspect that all terrorist organizations in the world are secretly run by Jews. They use the terrorism as the excuse to promote war, genocide and land theft. Does it make any sense for Hamas to fire thousands of small rockets that do almost no structural damage and never kill anyone because they contain no explosives only for the Jews to respond by dropping 2,000 pound bombs that demolish houses and businesses and kill thousands? This ISIS, which is the name of an Egyptian goddess, has to be run by Jews in order to sucker the American sheep into sacrificing another generation of young people on the altar of Judaism in the Middle East. I’d like to make a prediction. Within 2 years, the Jews will claim that there’s a major Russian terrorist organization and all young people in the U.S. must be forced to fight it. Guess who’ll run that Russian terrorist organization; none other than the Jewish Mossad. Professor U.V. Kliutchnikov summed it all up February 1920. You will understand then why Putin will continue to push into Ukraine (Southern Russia). This is all God’s work. A revolution in Ukraine was vital for the United States. America’s colossal debt of $17 trillion is pressing its leaders ever harder to search for a way out of the disastrous economic situation. The leadership of the United States sees a way out through either conquering the European markets or fuelling a war, for which the conflict in Ukraine can serve as a sort of fuse wire. It is clear that this kind of policy will result in the eventual collapse of the Ukrainian economy. It has already triggered an outflow of nearly one million refugees. Ukraine will cease to be a friendly state of Russia’s and get squeezed into the NATO gun clip strip, bringing its missile defence installations and first-strike weapons much closer to Russia’s borders. The hypocrisy of the West is made clear in that, on the one hand, it forcibly detached the Serbian districts of Kosovo and Metohija through direct aggression and ethnic cleansing from Serbia as a whole. On the other hand, it is cynical in not recognizing the expression of the will of the citizens of Crimea and Novorossiya to reunite with Russia. Sobotka thinks that one can trace the genesis of the current conflict to the “realisation of ambitions to expand NATO and the EU through the Ukraine without holding a real dialogue with Russia, and without giving Moscow an opportunity to influence this process in some way”. Sobotka pointed up that Russia finally accepted the membership of the Baltic States in NATO; no conflicts arose as a result. In the present case, Sobotka noted that the Ukraine is rather larger than the Baltics are… this gives it a greater influence on Russian policy. External geopolitical pressure, with the NATO/EU and Russia competing for the Ukraine, has significantly threatened its integrity. Sobotka thinks that Russia’s main aim is to keep neutral buffer states on its borders; Moscow is ready to sacrifice anything, including economic prosperity, for the sake of this. Do you think that their rhetoric changed to reflect a desire for peace? If this be “Satanism”, then, the world needs MORE of it… God bless Vladimir Vladimirovich. You can tell the measure of a person by the enemies that they attract… look at VVP’s enemies! Need I say anything more? THIS is what the murderers in the junta do… and America slobbers in glee. It’s why so many Russians hate the Unia and everything that it stands for. The Vatican wants to subject Russia to the pope… it’s what one of their spurious Fatima “prophecies” promised (“Russia will be converted”… in a pigs’s arse). We shall stand TALL for the Motherland and for the True Church. Working on a New Video…will excoriate Zionist christians. In-depth research. Stephen Cohen is one of America’s top experts on Russia. Cohen is professor emeritus of Russian studies and politics at New York University and Princeton University, and the author of a number of books on Russia and the Soviet Union. This is a horrific, tragic, completely unnecessary war in eastern Ukraine. In my own judgment, we have contributed mightily to this tragedy. I would say that historians one day will look back and say that America has blood on its hands. Three thousand people have died, most of them civilians who couldn’t move quickly. That’s women with small children, older women. A million refugees. This is truly an awesome site and Institution/Foundation. The mighty and awesome work of Bro Nat is indeed a powerful revelation. I respectfully disagree that Germany will deal in the yuan/ruple. Not so, as the Jew has total control over the economy/political and social just as in the U.S. and have had since Amsel of the red shield took control of the Hessian kingdom. The Jew hates the Germans as much as the Russians, and for no reason as the Germans were the most inclusive of all the European nations. And by the way Bro, you never mention these criminal ministers of the dispensationalist agenda. That’s the reason the Jew is able to do what they do, not just the Federal Reserve, European Central Bank, Bank of Restitution etc. Why would you make this FALSE accusation against me? Better be careful since the law of God states that “bearing false witness” is a serious sin. I have done Videos exposing the dispensationalist error and of John Hagee exposing his errant “dispensationalist” dogma AND many Articles refuting dispensationalist misinterpretation of Holy Scriptures. SEVASTOPOL, September 06, /ITAR-TASS/. The authorities of Sevastopol and Crimea have confiscated local assets belonging to Ukrainian big business tycoon Igor Kolomoisky for debts. Sevastopol’s city administration has told ITAR-TASS that the list of confiscated facilities includes an oil tank farm, a gas fuelling station and sixteen car filling stations. Police and self-defence forces took over the assets and put under guard. Inventorying is in progress. “At the oil tank farm no documents confirming property rights have been found. It looks like has been used arbitrarily all the way,” a Sevastopol government official said. On September 3, Crimea’s State Council made a decision to nationalize all assets belonging to Kolomoisky, the Dnepropetrovsk Region’s governor, whose Privatbank defaulted on its liabilities to Crimea’s retail clients. Sevastopol made a similar decision a day earlier. Germany is completely ruled by Jews. Why did Merkel gave Israel two nuclear submarines costing both 1 billion? Why is Germany giving billions to holocaust survivors? Germany is aligning itself with the US when it comes to Russia. The only countries opposing actually somehow sanctions on Russia are Italy, Greece, Hungary and France (or should I rather say Marine le Pen ). All the others are supporting the US. Speaking of Italy, here are a few links which give some insight to where US taxpayers money is being spent. Over 300 million dollars spent on the expansion and update of a US military base in Vicenza Italy. With a national deficit of 17 trillion dollars, I hope Americans think about this the next time your congressmen, and the mainstream media, are spreading fear propaganda about cuts that need to be made here at home. Think about the money spent on bases that we don’t know about. Seems Italian residents are not very happy. According to one article, they cover 40% of the operating costs. I am happy to know that some Italians have been protesting the Vicenza base. I had not seen or read your articles of Dispensationalist ministers, so I apologize, and am happy to see that fact. They are the root of the problem that allows the Jew to do what they do to us. Zionist Christians are in numbers to the tune of 100 million in the U.S. Just try and tell them anything and you will be shut down immediately. Van Impe, I believe, is one of the worst along with Hagee. And no one can touch either one as they are wealthy beyond imagination. Someone got the IRS on Van Impe’s case and it went nowhere. And I can imagine why!!! One might ask, “What does Ukraine have to offer to the rest of Europe”. They have been traditionally called the ‘bread basket of Europe’, and so their wheat harvest seems to be important. Enter Monsanto, and their demand, vis a vis the IMF, to allow GMO crops to be introduced. You now begin to get a sense of what the globalists are up to. Those Jews plan to kill us all. They want to spread sin. They may even be preparing to unleash the Antichrist. Ukraine has the most fertile land in Europe. I hate those ignorant people who support Jews unconditionally. They will go to hell when the end of time arrives. Only violence can solve the Jewish problem, or else a miracle. If the world does not change soon then the End Times are to arrive. I am just a beginner at all this point of view but of course it makes a lot of sense. I like reading and listening to Brandon Martinez writing and interviews. I am wondering if you can point me to information listing Jewish members of US government past and present? Do they have to be Zionists, and how can we tell?